To most thrash fans, the big four consists of Metallica, Megadeth, Anthrax and Slayer. To the unsuspecting passerby of a thrash fan, the big four consists of indescribable odor, questionable stains, yellow teeth and unkempt lice infested hair. 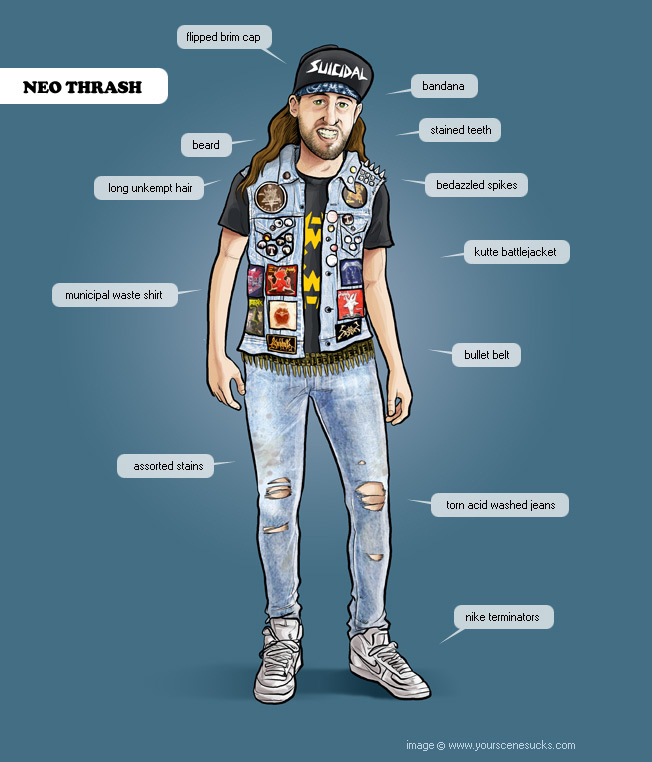 No neo thrasher would be complete without his kutte or battlejacket or smelly vest with way too many patches. The kutte is the thrash equivalent of a TGI Fridays waitress vest, the more flare the merrier. Spending endless hours scouring ebay for patches and bedazzler replacement parts, he hardly has any time at the end of the day to watch any of his 80s VHS troma movies. On a number of occasions his mother has snuck into his bedroom in the basement in an attempt to febreze his beloved battlejacket, but has ultimately failed as it seems he never removes the vile vest. Stuck without a job, a futon covered in beer cans, a Metallica with short hair, a boom box that eats cassettes and a shower that hasnt felt his presence in months, the Neo Thrasher seems to be at his lowest. Fortunately there is a kegger behind the abandoned gas station this Friday.